I've had the pleasure of knowing Mark for several years now, and not only is he is a seriously skilled rider, he has an amazing business head on him too. With what could be described as one of New Zealand’s dream jobs he is the main man behind the scenes at Auckland’s Woodhill Bike Park. It’s a vibrant city, yet has a truckload of outdoor activities and attractions within 30 mins (outside of peak hour traffic) of the city centre. It’s just a bit far to ride to Woodhill from home every day so I have to battle a bit of traffic. How did you get involved in the mountain bike scene to begin with and how long ago was that? I got involved in the Woodhill Mountain Bike Park in 2002 where I bought into the newly formed Bike Parks Limited. Managing Director of the Woodhill Mountain Bike Park. Anything from working with the financial side of the business, marketing, park sponsorship, and my favourite part—working in the trails with crew. What are the 5 benefits of working with bikes all day every day? While we don’t work directly with bikes all day every day, working in the park and on our business all day every day brings the benefits of working in the outdoors; it keeps us fit and healthy, we get to see the huge amount of enjoyment our riders get from riding the trails we develop and maintain, we get to work in a constantly evolving industry filled with amazing technology, and get to ride our bikes as part of job from time to time! Jimmy (at Worralls) and the boys often call me a hucker, so maybe my style is Old School Hucking. 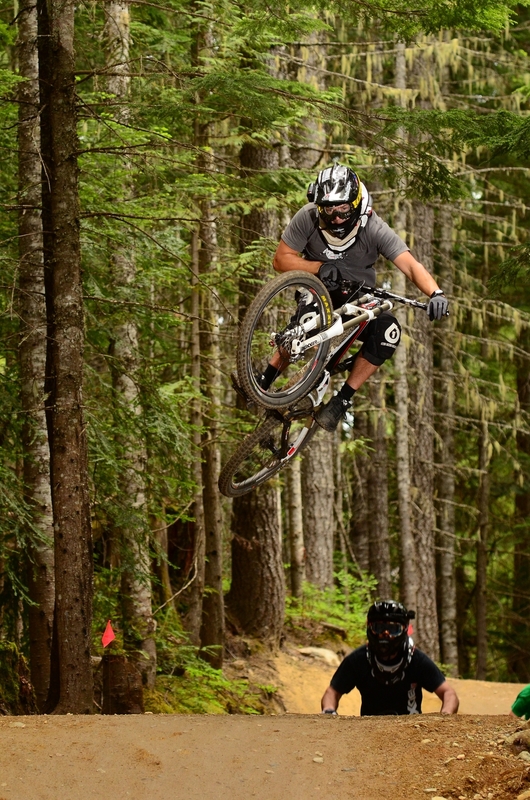 Dirt Merchant into A-line at Whistler. Any vision can be achieved if there is enough passion, drive and commitment from a great team. Only the accidents and injuries that can happen in the sport. It gets you into a healthy outdoor environment, and it's truly fun and challenging while providing awesome fitness, regardless of your age, skill level or when you entered the sport. Mountain biking is a sport that anyone can embrace and constantly improve in, especially now with all the different facets to the sport. Top two mountain bike developments in the last 10 years? Cedric Gracia, Travis Pastrana and Tony Hawk. Not only awesome athletes, but also brilliant businessman. Ice Cream, Black Sambuca shots (after far too many beers). Have a great coffee, read the newspaper and then go riding with my mates. Happens often but never enough!